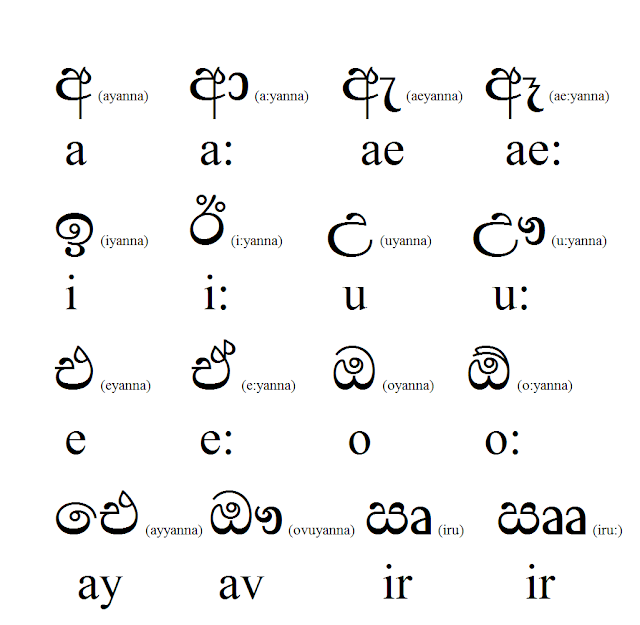 I will show you the Sinhala alphabet. I recommend learning it too. Following picture shows the Sinhala vowels. Beside (in front of) each letter is the name of the letter and below each letter is the sound it represents. The first 12 vowels are very important. 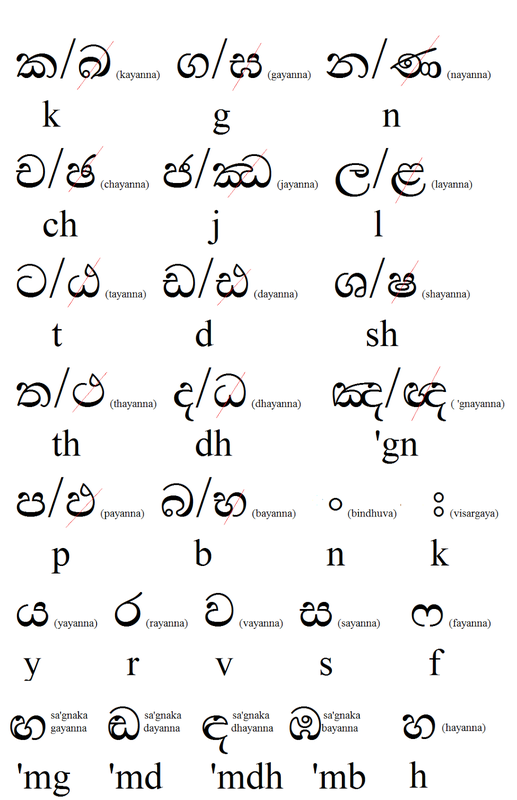 The following picture shows the consonants of Sinhala alphabet (not in the conventional order and format). I have crossed out some letters which are redundant and useless (I vehemently support removing these pesky letters from the operating alphabet). Actually you should remember all the letters, but I suggest you to use only the letters that are not crossed out. However, in Sinhala, you can’t use this method. Instead you use diacritical marks (called “pillam” or “pili” in Sinhala) to denote the vowel sound a consonant letter possesses. Actually all the letters shown as in the above picture already have the vowel sound “a” in them (but they are the default letter forms). The real consonant form must be shown by using a diacritical mark called “kodiya”. After applying kodiya, the letters are called “hal akuru” (akura means letter, and akuru is the plural of akura). Applying a kodiya (to a default letter) is called “hal karanava:”. There are two forms of “kodiya”, and I will list them all in the following table. To show clearly how this diacritical mark in both forms is applied on characters, I have enlarged the first cage in the table. Sa’gnaka letters can never take a kodiya. In addition, bindhuva and visargaya too cannot take a kodiya (these two letters are natural “hal akuru”, and cannot take any of diacritical marks). As you can notice, each vowel has a pillama (some vowels have two pillams too). In the following table, I have listed all the Sinhala consonant+vowel combinations. Even if I have shown you all combinations, in practice you will not find some combinations (I have colored them red). I suggest you to write in the letters shown with greenish background. And, I have colored the exceptions in blue too (memorize the differences). You can read tons of text in Sinhala letters on the Internet. To read and write Sinhala letters, you must have a Sinhala font in Unicode standard. The Sinhala font “Iskolapotha” designed by Microsoft is really perfect. All the modern operating systems in computers and smart phones now support Unicode standard, but most probably these devices may not render/show Sinhala though (instead, you will see a bunch of small boxes). The problem is that these devices have no Sinhala Unicode font installed on them yet (after installing one, you can work with Sinhala easily just as you would work with English or any other language for that matter). Due to some technical glitches, sometimes (mostly Windows operating systems) you may not be able to write Sinhala correctly. In that case, there are some simple fixes (installing a very tiny program) and you can google them.